When someone mentions Eskimos or Inuit or people of the Arctic, the stereotype that most often comes to mind is snow houses and people in fur parkas eating whale blubber. However, as short as summer in the Arctic might be, people there eat plant food along with animal food. As a matter of fact, people of the Arctic eat a wide variety of plant foods. And we are fortunate to have a book with an extensive list not only of what they are but also how to prepare them. The book is called, "Plants that we Eat." Although the book focuses specifically on plant foods that are part of the Inupiat diet, the listing for each plant also includes a map of Alaska that shows the range of the plants. 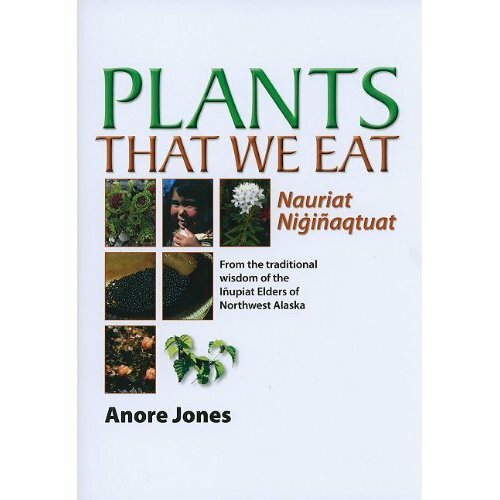 And although different Alaskan Native groups probable had their own preferences and their own unique ways of preparing plant foods, we can assume that many of the plants listed in this book were eaten by more than just the Inupiat. For that matter, many of the plants listed in this book can be found in the temperate zones of the lower 48. If you are interested in wild foods, this book would be a good addition to your book shelf. I just found your blog. It's great. I have built one fuselage style skin-on-frame boat and now I have the building bug. I have plans to do a traditional greenland kayak. I also like how you have the wild plant reference books on your blog. I love to build and paddle but, I consider myself an outdoorsman first. I find it fascinating how all my interests (eg. paddling, foraging, fishing, brewing and woodworking) are intertwined, much like the organisms that make nature so wonderful. Anyway, I'll be following my construction on my blog (imakemybeer.blogspot.com). Check out my Greenland kayak building instructions here. there's lots of ways of building a Greenland kayak of course and it's always good to have more than one.